A majority oppose relaxing the Eugene homeless code. 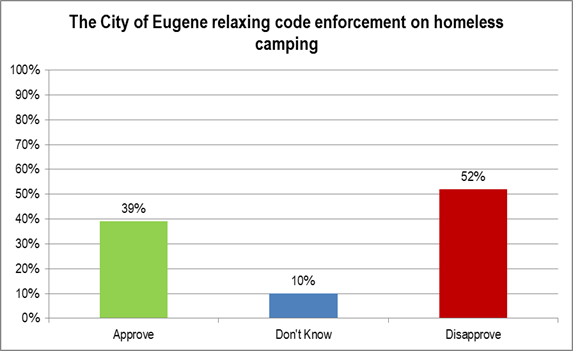 METHODOLOGY: 200 telephone interviews of City of Eugene likely general election voters were conducted the nights of June 1-2, 2015. The margin of error at the median is 7%. Figures may not add up to 100% due to rounding. There is strong support for a $15 minimum wage in Eugene. Voters not with either major party dominate the younger ages. Independents are more numerous up to age 45! Democrats start to pile up their numerical advantage over Republicans during ages 25 to about 45 and then starting again in the late 50s. Again, the 88% to 11% pretty much says it all. 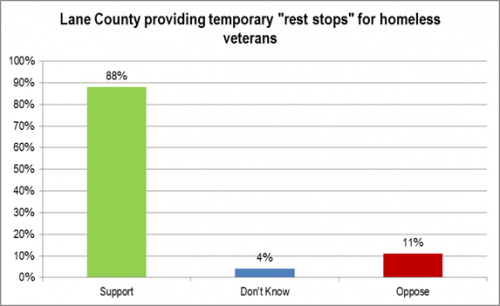 QUESTION: Do you support or oppose Lane County providing temporary “rest stops” for homeless veterans? The numbers are pretty self explanatory. 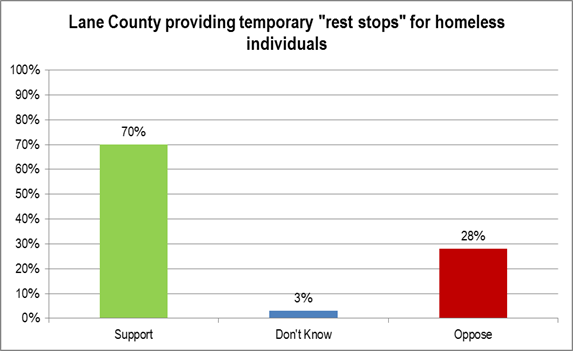 Note that the very small “Don’t Know” percentage means the issue is essentially decided. QUESTION: Do you support or oppose Lane County providing temporary “rest stops” for homeless individuals? There are more women than men voters and this numerical advantage starts to become evident relatively early on in the life cycle – during the mid 20s. The storm water fee increase at a knife’s edge. One should expect all “Don’t Knows” would oppose the measure. In addition, since the dollar amount is not mentioned, the support level is probably biased upward. 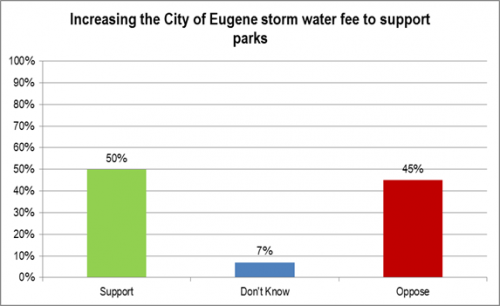 QUESTION: Do you support or oppose increasing the City of Eugene storm water fee to support parks? A library measure is supported by 57%. There are two points to note. First, the lack of a dollar amount means the support is a maximum and probably biased upward. Second, library measures in years past have usually done better than this. This could imply the city’s environment is relatively unfavorable. 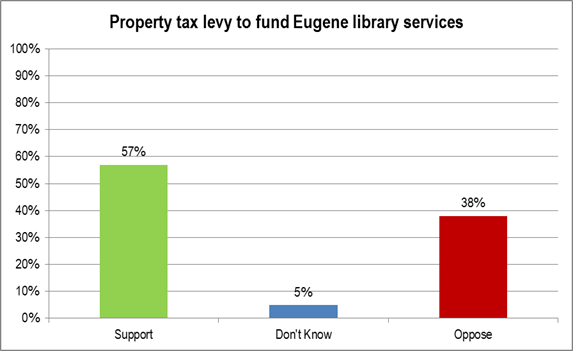 QUESTION: Do you support or oppose a property tax levy that would fund Eugene library services? 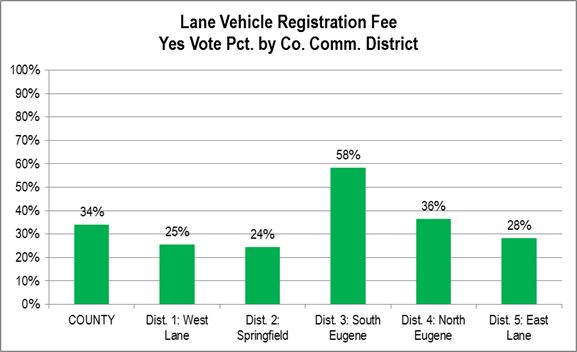 As with the Lane County Commission districts, the yes % pattern generally followed the typical lines. One interesting grouping, however, stands out. The south Eugene wards (1, 2, and 3) were most supportive. The north Eugene wards (4 and 5) were next most supportive. The west Eugene wards (6, 7, and 8) were least supportive. Ward 7 appears to be transitioning from being the old central Eugene ward into being one of the west Eugene wards. This, if it becomes a trend and continues, could make the 2016 Ward 7 city council contest very interesting since councilor Syrett has been one of Mayor Piercy’s strongest allies on the council. The support for the vehicle registration fee generally followed the expected pattern. 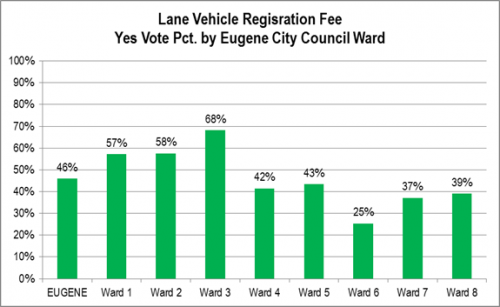 South Eugene was most supportive, just as it was for the 2013 Jail Levy. North Eugene came next. Interestingly, however, is that East Lane’s Yes % exceeded by Springfield and West Lane. This was, in part, driven by the comparatively higher Yes % in southwest Eugene.